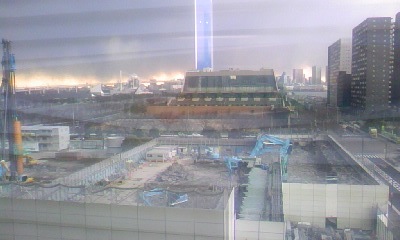 My office is on 'reclaimed land' in the Tokyo bay. At first we thought the earthquake was just a little one.. we had a small one two days ago, but then it got really big and we hid under the desks. when it stopped, we assesed the damage which was nothing much and so we evacuated. 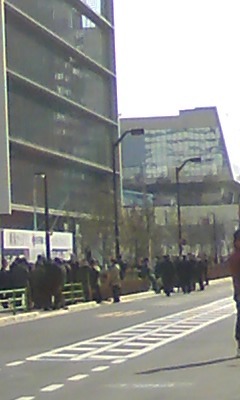 About 30 minutes of waiting outside in the cold, we went back up, and just as we were settling back in to work, there was another huge quake. This time we didn't hide under the desks, we speed-walked back down the six flights of stairs, shouting at each other not to run. There was an announcement from the city to go to the designated evacuation areas, so we went to the park on the corner, but the place we were supposed to evacuate to had a crack in the land !and was leaking!! (landfills are not the most stable places in the first place). Then there was an announcement there would be a tsunami, so we went back upstairs. The tsunami didn't reach us, so we were told to go home. Actually we asked if we could go home, and were told the word from the president was to "use your judgement". What the hell does that mean? we all wondered. Another aftershock and we were starting to get nervous, and my boss shook his head, and excused us. ... but then there was a little problem with all the trains were stopped, the streets clogged with traffic, and the phones not working. A group of my cowworkers were walking to Ginza to try to ride Japan Rail trains (instead of the subway), which was close to Takeshi's office. An hour or so of wandering in the cold and we found each other there... *phew*. We went into his building and there were cracks and broken celiing tiles... some people were wearing the official distributed disaster helmets, but most were just chatting and wondering how to get home. We found a restaurant that was open.. right next to it in the underground plaza they were setting up tarps and newspapers for people to have a place to sit down while waiting for the trains to start back up. Me, Takeshi and two of his coworkers found that one of the train lines that go to our place was up and running if we were willing to walk for 20 minutes. So we hiked through the city, the streets jam packed with cars not moving an inch, but mostly people sharing excited conversation about the scraps of news we had heard. It was the voice of people who got away by the skin of their teeth and knew it. When we finally got to the Oedo line, we stopped and looked at each other. The line was worse than a major disneyland attraction, it stretched out of the large station and around the block. "Should we stay over at your company? They have futons there, right?" We dejectedly walked back, dreading the 'told you so's of the employees who stayed behind. As a last resort, we checked the Yurakucho line, which was miraculously running and not even crowded. Amazing. So thanks to that, we were able to get home unscathed, only 7 hours after the earthquake. Now I'm watching the news... it looks really bad up north. Glad you're both alright! Keep keeping us all humorously informed! Where is your office located? 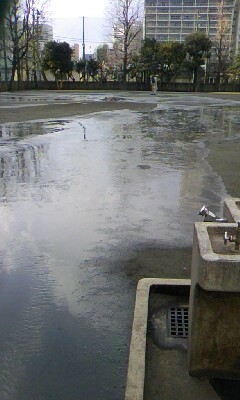 You must be in Odaiba? 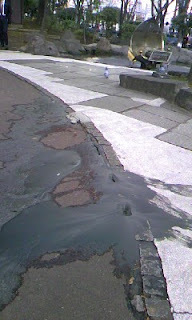 I didn't see any cracking of the land or really major evidence of the quake over in Shibuya and Shinagawa. Glad to hear that you made it back with only 20 minutes of walking! I'm shocked that the Yuurakucho line was running, none of the lines I saw were running at all. Kachidoki! We could see an office building on fire across the bay in odaiba, which was pretty scary. Yeah, they must have not announced that Yurakucho line was running at all because it wasn't online anywhere... we got really lucky. Seems pretty much everything is back to normal in Tokyo now, but something like 300,000 lost their homes up north. yikes!